The titles below are links to our Backyard Wild Birds Blogs. The individual Blogs contain specific information and Birding FAQ's about their topics. The Blogs can also be a place to post birding questions and comments. Backyard Wild Birds - Blog - Birding FAQ's and ideas about how to attract, feed, and enjoy Backyard Wild Birds are explored here. Create your own backyard habitat with landscaping ideas that incorporate Backyard Wild Birds feeding to them. 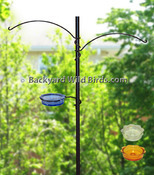 Backyard Bird Feeders - Blog - Bird Feeders are designed for different bird seed to attract a great variety of wild birds. Tips on what Bird Feeders are best on poles, decks, posts, walls and trees. Provide solutions for unwanted guests like squirrels and grackles. Make bird watching an enjoyable and rewarding experience. Attract Hummingbirds To Feeders - Hummingbird FAQ's and ideas about how to attract, feed, and enjoy Hummingbirds. Reviews of what types of hummingbird feeders are best for: attraction, avoiding pests and the easiest feeders to maintain. Hummingbirds really are amazing little birds. 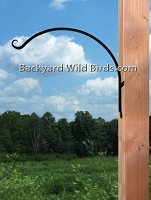 Bird Feeder Pole - A good bird feeder pole is one that will last a long time and can be made squirrel proof. If you want to be more than a casual bird feeder you will eventually have to address these issues. This will be the focus of Bird Feeder Pole blog. Squirrel Proof Feeder - Squirrel Proof Bird Feeders are possible with the right squirrel Baffles and Bird feeder Poles. This Blog discusses ideas and methods on how to accomplish this.